I was a little disappointed with this tour. We did more driving through neighborhoods instead of stopping at the high points like the Space Needle, Pike Place Market.. we just drove by. Ron was fantastic and very informative about the history of Seattle. 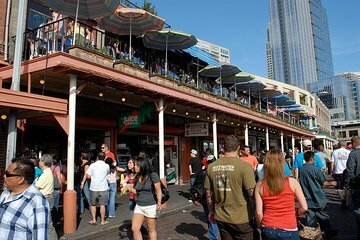 I believe we covered most of the best parts of Seattle, and I recommend this tour to anyone looking for an easy and informative tour of this special city. Awesome Tour! This is our 2nd Viator Tour and they both were exceptional! Highly recommend for 1st time visitors and anyone else who has not experienced the city! Jeff was very knowledgeable about the area and it’s history. Maybe make it so the stops can be longer. Absolutely take this tour. Informative and you will see way more than exploring on your own. The guide even picks you up at your downtown hotel. Can't ask for an easier way to see the city and beyond! Great guide that gave all the highlights of the city. The tour was fun and had great views of the city. Several stops to get out and take pictures. Lovely comfortable 3 hour ride around Seattle. We enjoyed this tour very much! Saw all the sights of Seattle and some beautiful residential neighborhoods and great views. This tour gives a great overview with a interesting comments from the the tour guide, Jerry. You will learn so much about Seattle. We stopped for a few minutes in Pioneer Square, Fisherman Village and Kerry Park, The stops wewere not long which we appreciated. Would highly recommend! Perfect for a first time visitor, first day in the city activity. Jerry was an excellent guide. It was amazing how much we saw in only three hours. It was very interesting but would have liked more details about the city. The guide did not talk about history or tell stories of events as much as I would have liked.